The Green Environmental Coalition (GEC) will present the award winning documentary, Gasland at the Little Art Theatre on January 29 at 3 PM. This film documents the journey of filmmaker, Josh Fox, who in 2009, learned that his home in the Delaware River Basin was on top of the Marcellus Shale, a rock formation containing natural gas that stretches across New York, Pennsylvania, West Virginia, and Ohio. He was offered $100,000 to lease his land for a new method of drilling developed by Halliburton and soon discovered this was only part of a 34-state drilling campaign, the largest domestic natural gas drilling boom in history. Gasland documents Josh’s cross-country odyssey to find out if the controversial process of hydraulic fracturing- or fracking- is actually safe. 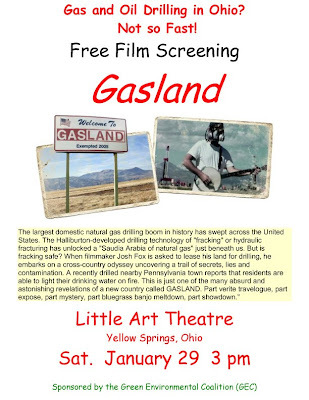 This is a must-see film as the process of fracking is currently spreading across most areas of Ohio. Recently an out of state gas and oil exploration company was conducting surveys in the Yellow Springs area. In addition to the film, GEC will present an update on this situation and suggestions for how the community can help.